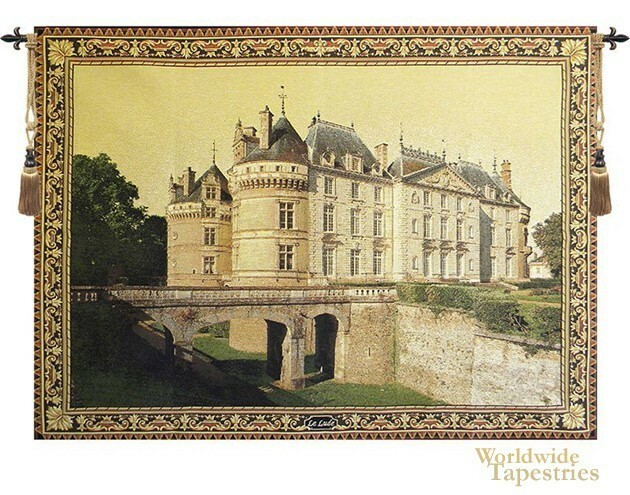 This tapestry shows Le Lude castle from the 11th century in fine detail. This castle is one of the many beautiful and most revered chateaus of the Loire Valley in France. The castle stands at the boundary between Anjou, Maine and Touraine. Originally built sometime between the 10th and 11th centuries, the castle sits on the banks of the river Loir. This tapestry shows the French architectural influence on the design of the castle as well as the fertile gardens around it. It was used to defend the region of Anjou from the Normans and subsequently the English during the Hundred Years War. Fine in its detail and refined in its use of subtle color, this stately tapestry is a prime example of a beautiful castle tapestry which shows off the elegance of these French chateaus. This tapestry 'Le Lude Castle' is backed with a lining and comes complete with a tunnel for easy hanging. Note: tapestry rod and tassels, where pictured, are purchased separately.